This article gives a behind the scenes look at how Metric Insights captures data from your SSRS reports. It covers how Metric Insights designates each SSRS report via an "id" and a name. It covers how Metric Insights identifies each chart or table within a SSRS report as a separate entity for pulling data. 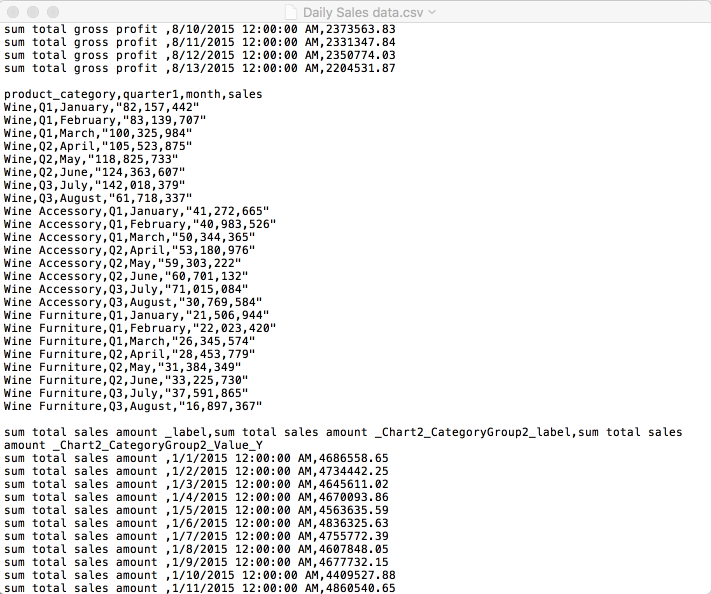 Finally, it covers how the fields are identified in each chart or table and how data is extracted. Metric Insights captures the 'report name' and the 'report id' of each report in SSRS, and gives you the option of which to show in the Report dropdown list in the Element Editor. This is the list of SSRS reports. 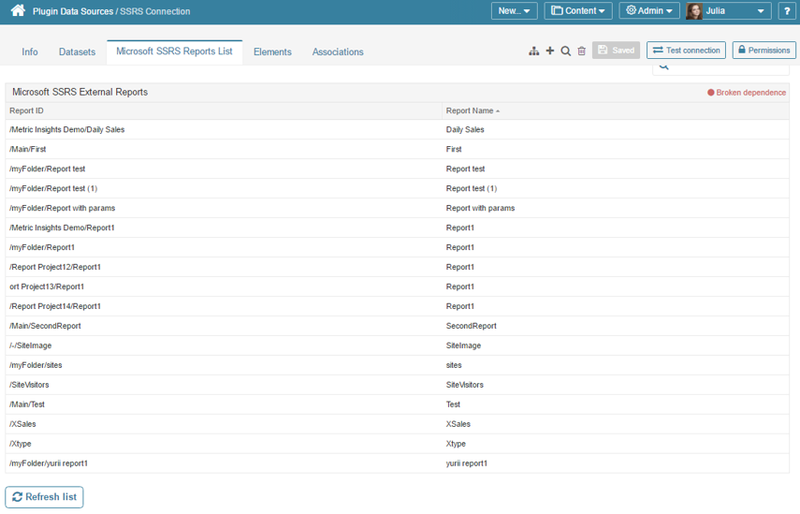 Here is an example listing of SSRS reports, designated by 'Report ID' and 'Report Name'. We will look specifically at the "/Metric Insights Demo/" reports. Metric Insights obtains the list of SSRS reports by navigating through the SSRS folders. In the resulting HTML (see screen shot) it then uses the url of each report for the 'report id', and the name of each report for the 'report name'. In this example, 'report id' is "/Metric Insights Demo/Daily Sales" (url decode of "%2fMetric+Insights+Demo%2fDaily+Sales"). And 'report name' is "Daily Sales". If the SSRS report contains more than one chart or table, then Metric Insights will append the chart or table name to the 'report id' and 'report name'. 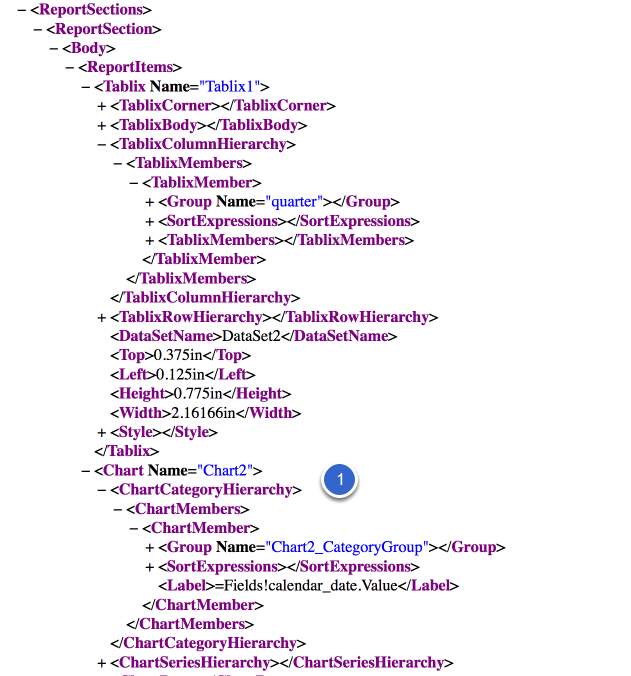 In this screen shot, the SSRS report contains one table and two charts (seen to the right). In the next section we will describe how Metric Insights determines the internal name for the table and charts found in a SSRS report. Metric Insights obtains the chart or table names for each SSRS report via the Report Definition Language (RDL). Thus, 'report id' for "/Metric Insights Demo/Daily Sales" for the table becomes "/Metric Insights Demo/Daily Sales&Tablix1.quarter.month", where it includes the table name of "Tablix1.quarter.month". And 'report name' is "Daily Sales&Tablix1.quarter.month". Metric Insights will then be able to pull data for this table. Subsequently, it can do the same for the two charts as well. Metric Insights obtains names and data types for each field in a chart or table via the SSRS ATOM file for that chart or table. 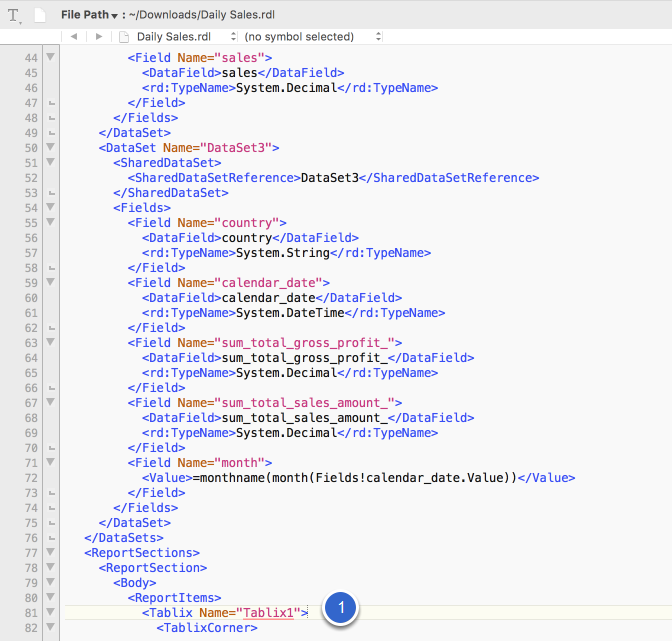 Metric Insights also uses the ATOM file to get the data for each chart or table in a SSRS report. Metric Insights obtains the data for each chart or table via the SSRS ATOM file as in previous example. However, you can see the similar data when you manually export the report to CSV. In this example, the SSRS report has one table and two charts. If your SSRS report has more than one chart or table in it, then you will see a group of data in your exported CSV for each chart or table. In this example, the middle section of the CSV contains the data for the table. Note: This is why Metric Insights identifies each chart or table in your SSRS report for data pull. Each chart or table contains a different set of data. 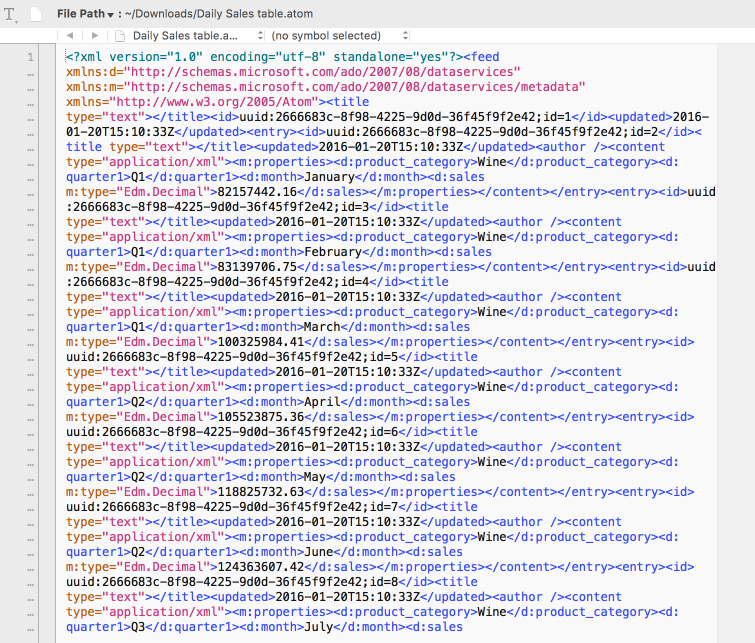 And Metric Insights pulls the data via the ATOM file instead of CSV as explained earlier.